You can’t miss the vivid plumage of the scarlet ibis! They are a nomadic bird whose range varies between nesting and foraging sites. Nesting takes place in northwestern Colombia and along the Atlantic coast and into Brazil. 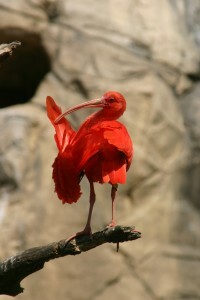 Scarlet ibis can be found from Venezuela to Eastern Brazil, depending on the season. Conservation Status: They are listed as least concern and are protected by the U. S. Migratory Bird Treaty Act. Scarlet ibis are also listed as “species not necessarily threatened with extinction, but in which trade must be controlled in order to avoid utilization incompatible with their survival” by CITES (Convention on International Trade in Endangered Species of Wild Fauna and Flora). Colonies of scarlet ibis can have anywhere from 20-600 nests.